This is the seventeenth in a series of chimerical creatures; the aim is to create an alphabet of fabulous beasts over the coming months. The Quinotaur (Lat. Quinotaurus) is a mythical sea creature mentioned in the 7th century Frankish Chronicle of Fredegar. Referred to as “bestea Neptuni Quinotauri similes“, (the beast of Neptune which resembles a Quinotaur) it was held to have fathered Meroveus by attacking the wife of the Frankish king Chlodio and thus to have sired the line of Merovingian kings. The name translates from Latin as “bull with five horns”, whose attributes have commonly been interpreted as the incorporated symbols of the sea-god Neptune with his trident, and the horns of a mythical bull or Minotaur. It is not known whether the legend merged both elements by itself or whether this merger should be attributed to the Christian author. The clerical Latinity of the name does not indicate whether it is a translation of some genuine Frankish creature or a coining. 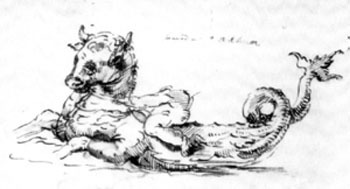 The mythological assault, and subsequent family relation, of this monster attributed to Frankish mythology correspond to both the Indo-European etymology of Neptune (from PIE ‘*nepots’, “grandson” or “nephew”, compare also the Indo-Aryan ‘Apam Napat’, “grandson/nephew of the water”) and to bull-related fertility myths in Greek mythology, where for example the Phoenician princess Europa was abducted by the god Zeus, in the form of a white bull, that swam her away to Crete. 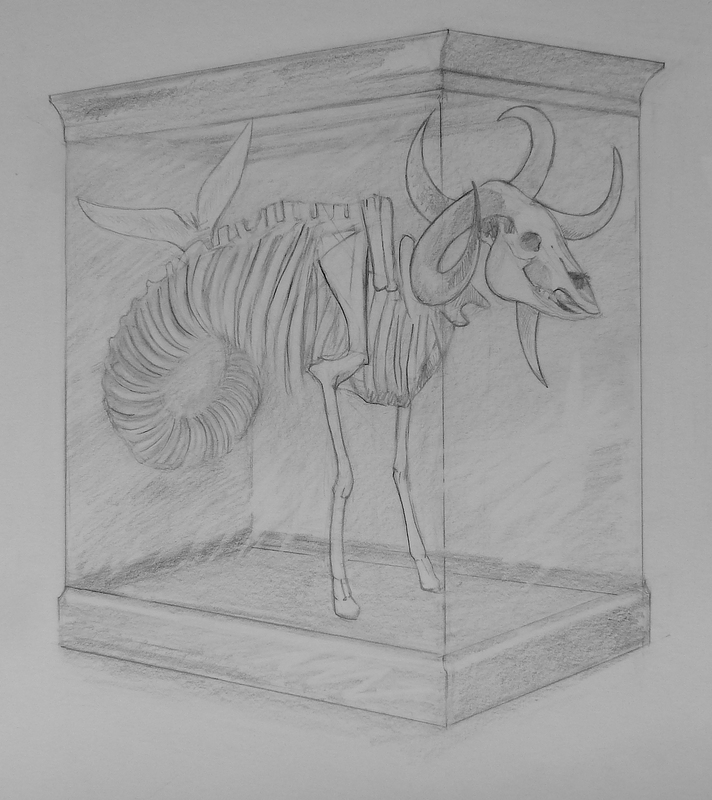 You are currently reading Sketchbook Page 53: Q is for Quinotaur at osteography.